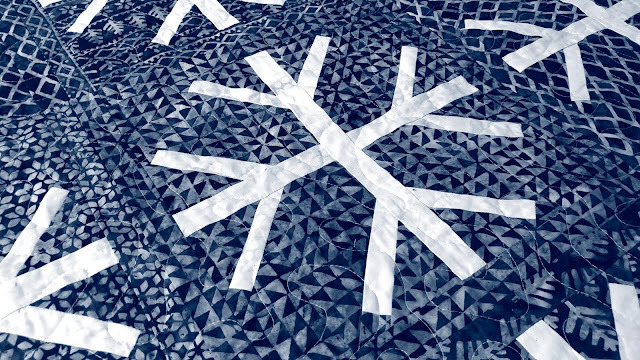 Slice of Pi Quilts: Snowfall Quilt - My 100th quilt finish! 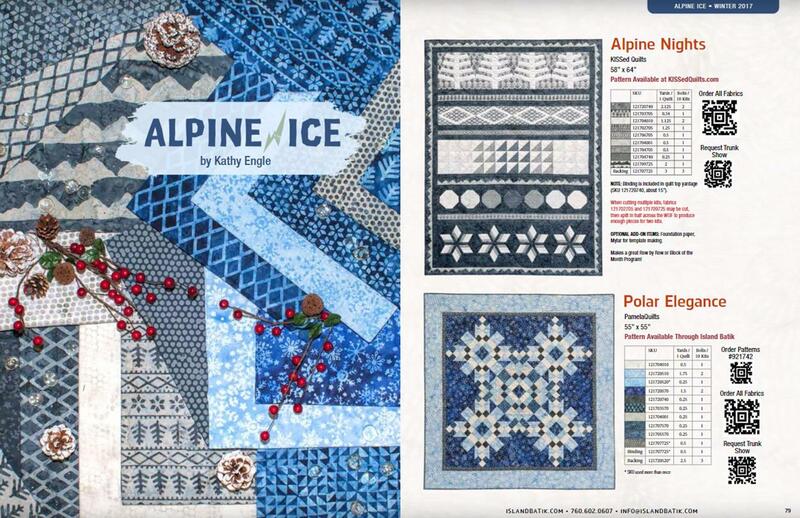 This version of my Snowfall quilt pattern is made with the new "Alpine Ice" fabrics by Island Batik. The fabrics are just now available for quilt shops to order, so watch for the fabrics in your favorite quilt shop in the coming months! After a run-in with some bleeding when I washed my first Snowfall quilt, I decided to prewash the blue fabrics for this quilt. The bleeding in the first quilt came out after several washings (without drying in-between), but I decided I would try and prevent it from happening a second time around. 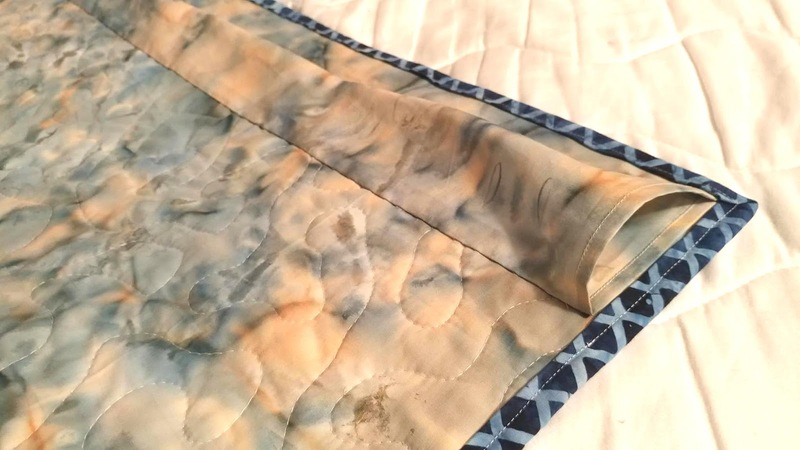 This was the first time I EVER prewashed fabric for a quilt! It's *really* hard for me to not share things as I sew them! Since the pattern wasn't a secret, I shared a few sneak peeks on Instagram and Facebook as I sewed. 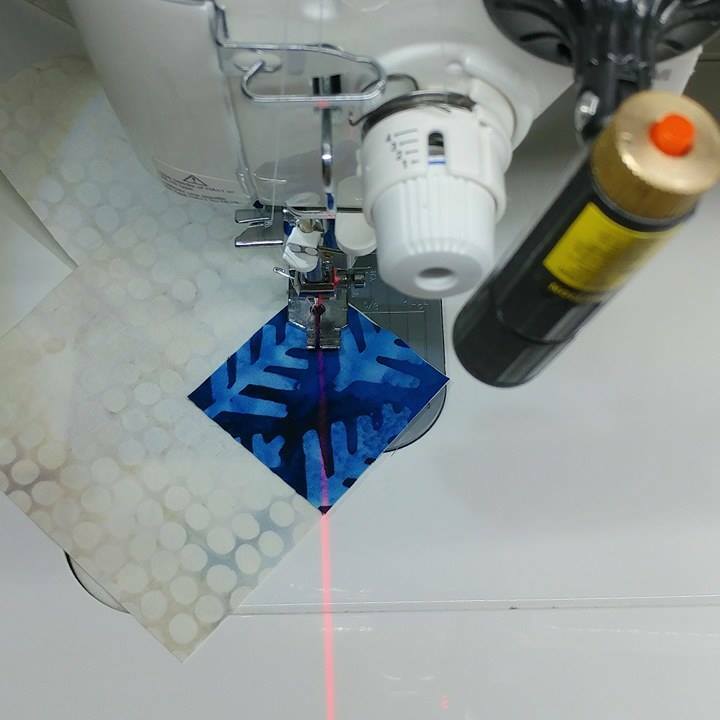 I love using my laser to save time when sewing! 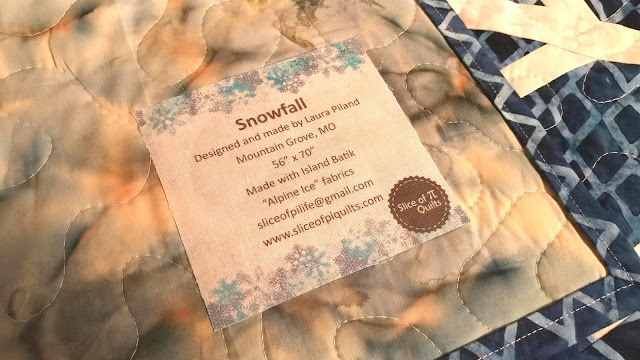 Another first for me: this quilt was the first time I ever used a "name brand" batting! I used the 80/20 cotton/polyester blend batting by The Warm Co. I pin basted the quilt and quilted a meandering design using the free motion foot on my Juki TL-2010Q using Aurifil 50wt Natural White #2021. And since we're counting now, a third "first" for me was hand sewing on a hanging sleeve on a quilt! I followed the tutorial for a permanent hanging sleeve here. I printed a label for the back (and used a little Elmer's glue when the fusible decided not to stick as well as I wanted). I finished the quilt at 11:30pm on Sunday, June 11th, squished it into a medium flat rate USPS box, and shipped it out first thing Monday morning! Unfortunately, that meant that I didn't get the best pictures. Fast forward three months, and my quilt is now in the Fall/Winter 2017 Island Batik catalog! 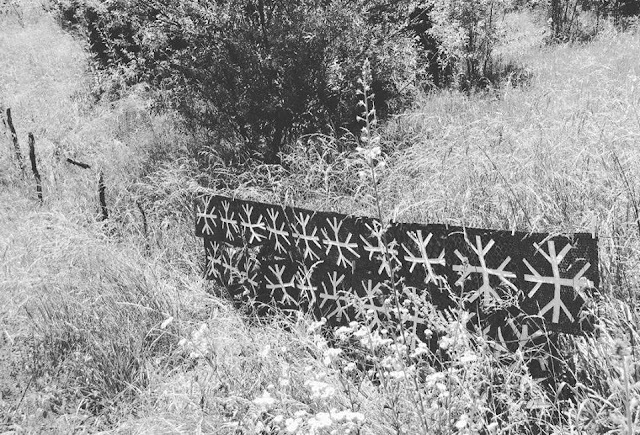 "Snowfall" is on page 80! 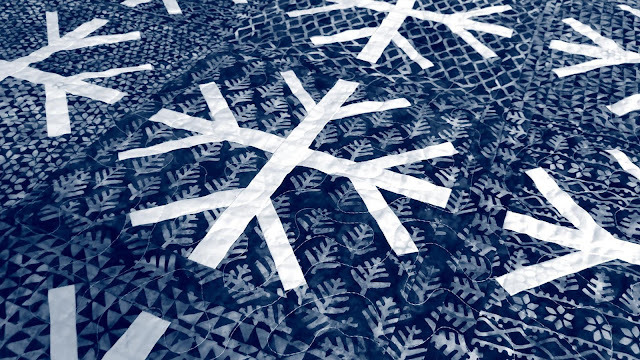 Quilt shops will now be able to borrow the Snowfall quilt from Island Batik for their shop displays for one year. After the quilt is done with its travels, I'll get it back! I am already working with Island Batik to make four! quilts for the Spring/Summer 2018 catalog! Two are from patterns you've seen before, and two others will be new patterns out later this year! I'll try to share some creative sneak peeks on Instagram and Facebook as I sew, but I won't be able to share the whole quilts with you until April! 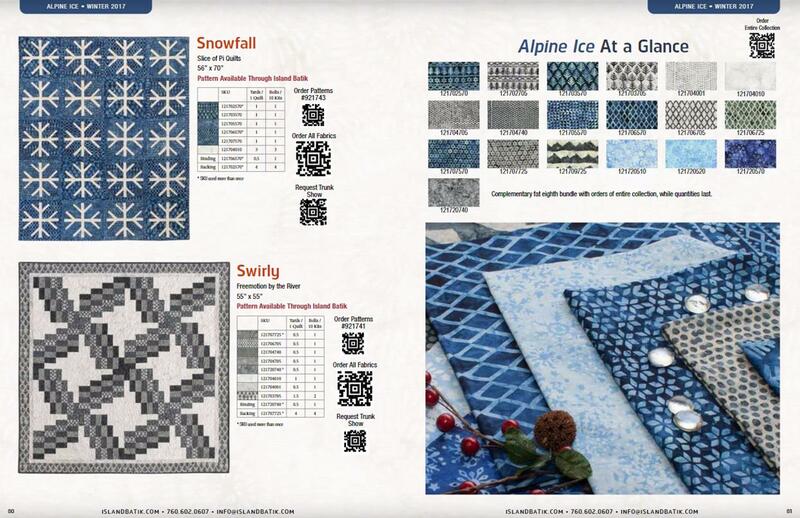 I'd love for you to ask your local quilt shop to carry my patterns! 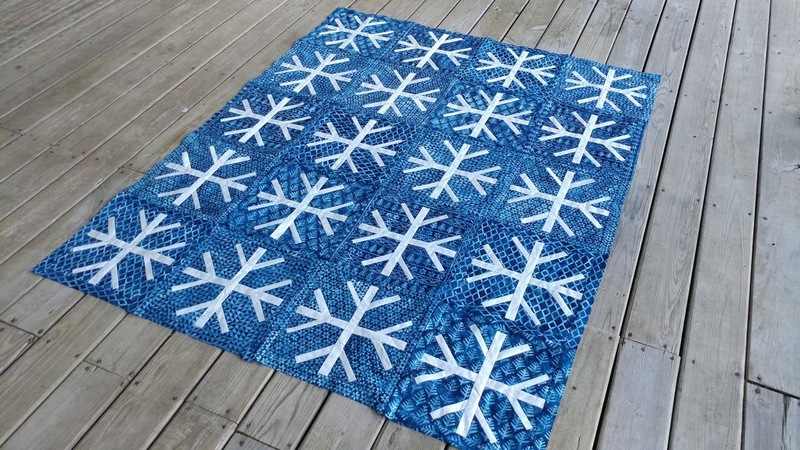 You can get the Snowfall pattern digitally on Craftsy and in my Etsy shop. You can get a paper pattern on Etsy too (if you leave a note at checkout, I'll even sign it for you!). This throw-sized Snowfall quilt measures 56"x70". 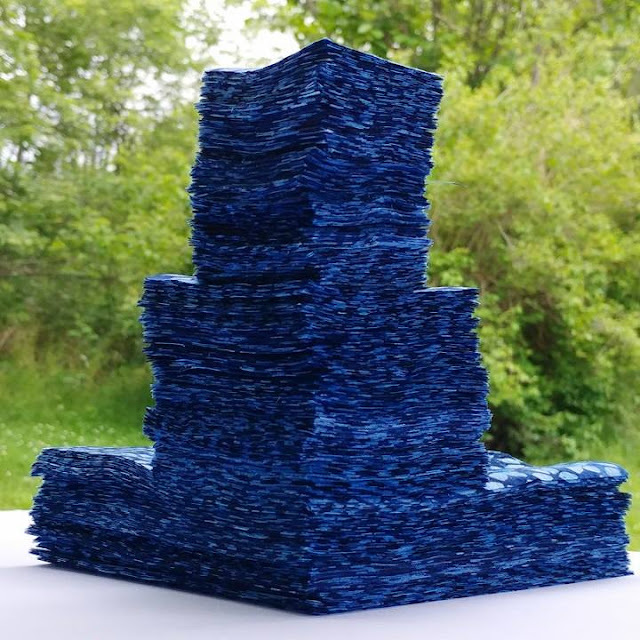 It was my 100th quilt finish of all time and my 21st quilt finish for 2017. 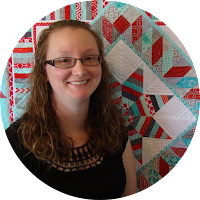 Linking up with Main Crush Monday at Cooking Up Quilts, Linky Tuesday at Freemotion by the River, Needle and Thread Thursday at My Quilt Infatuation, and Can I Get a Whoop Whoop? at Confessions of a Fabric Addict. Congratulations, it looks great in the look book! 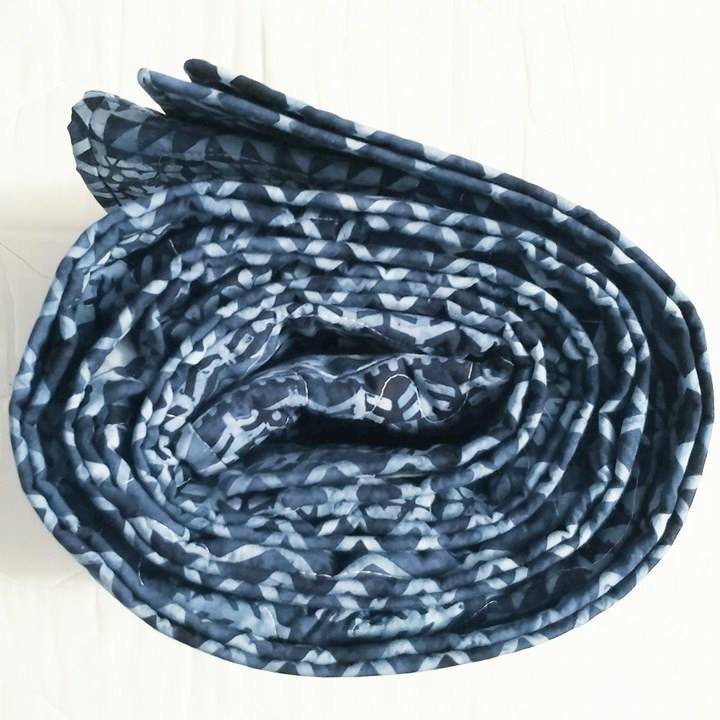 Secret sewing can be tough to do, and isn't it so fun to get to have a big reveal and finally share it?! How exciting to be able to reveal this big sewing adventure. Congrats on #100 (plus the other 11)!!! Did you use a color catcher in the wash with the fabric? How many times did you prewash? Congratulations on #100 and the bonus 11. The quilt looks beautiful. The blues are so yummy. It's really beautiful . 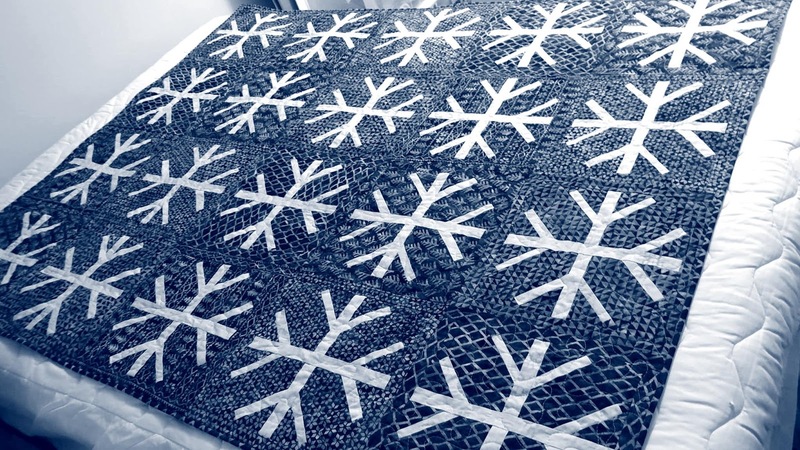 It would make a great winter time quilt to snuggle under. Congratulations!!! A wonderful milestone! Looking forward to your next 100 creations!!! This quilt is beautiful! Congratulations on finishing so many quilts and on having it printed in the catalogue. I am curious about the laser thing on your machine. Can you tell me more about it and where you purchased it? I can see it could be a time saver and make sewing HSTs very accurate. 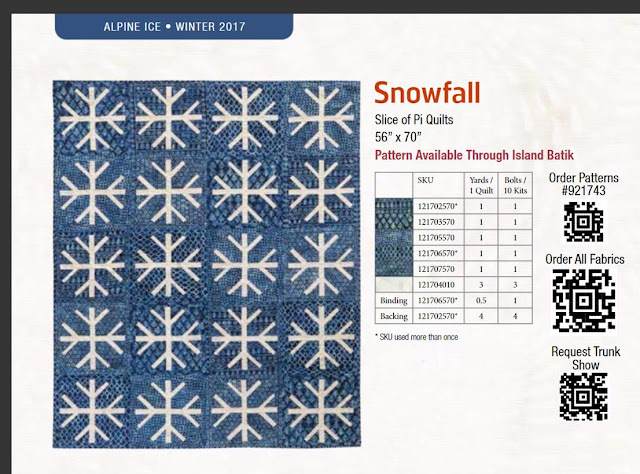 It is a really cute quilt, congrats on getting into the catalog! 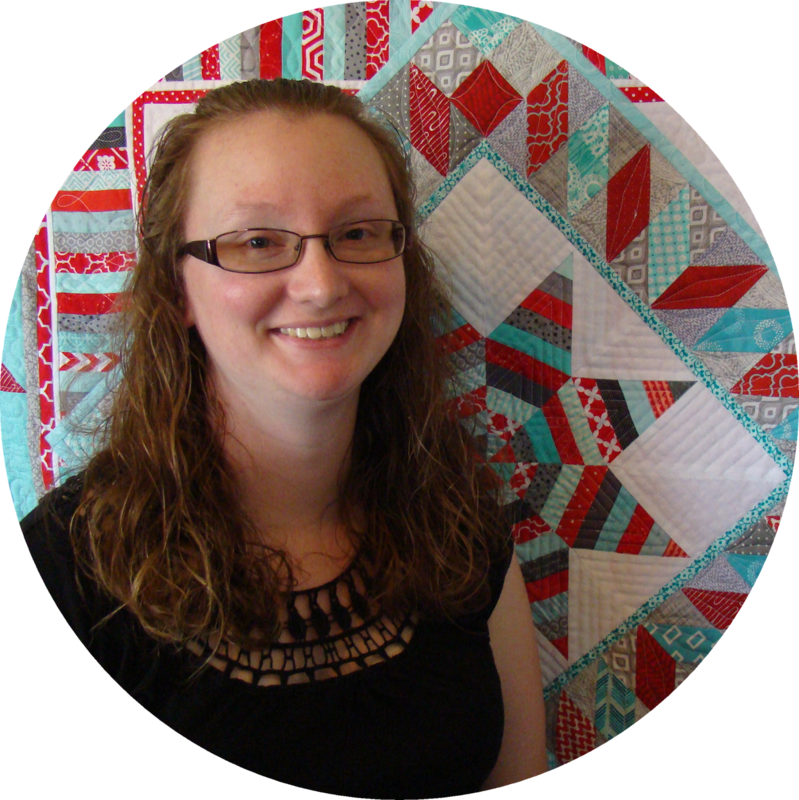 This is such an awesome quilt, Laura! Congrats to you!